Title: 'The Countie of Nottingham described'. From: ' The Theatre of the Empire of Great Britain' published by Bassett & Chiswell in 1676. The plate for this map was originally engraved by Jodocus Hondius. John Speed is synonymous with early county maps of Great Britain. He built upon the earlier work of Saxton and Norden and others to create maps that are recognised for the beauty of their engraving and their elaborate ornamentation. The fact that Speed's maps were reprinted so many times between 1611 and c. 1770 is testament to their quality and popularity. 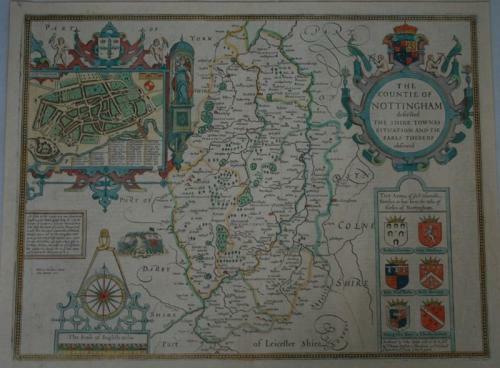 The map is hand coloured in outline, has a strapwork title and an inset plan of Nottingham. The condition is very good. Sold unframed.